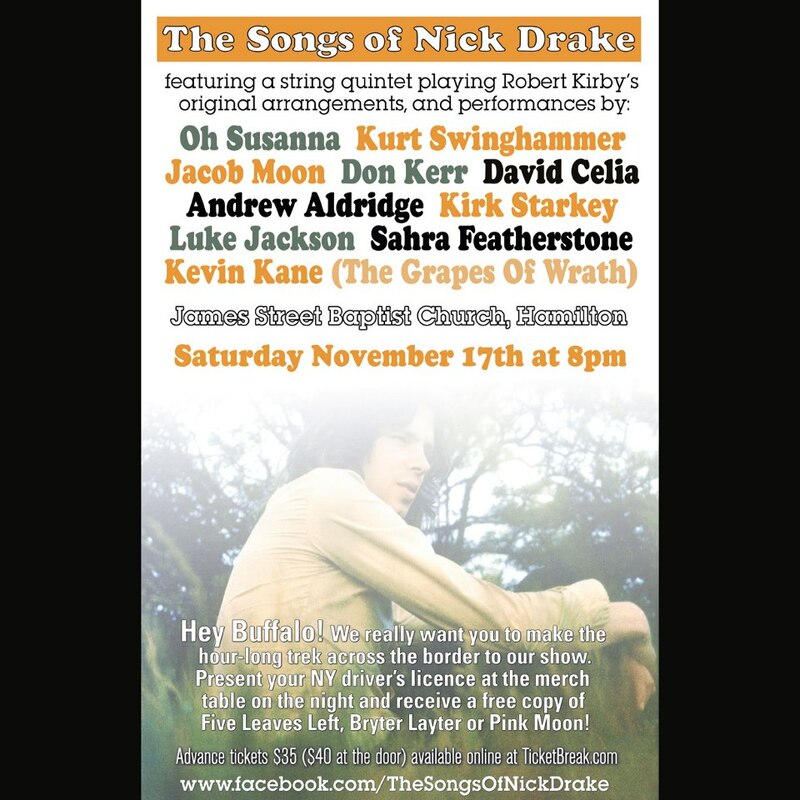 The Songs Of Nick Drake gives audiences in Ontario and Quebec a rare chance to experience Nick Drake’s music played by a host of Canada’s finest musicians, with a string quintet playing the original arrangements that were written for Nick’s albums by his friend Robert Kirby. To add to the intimacy and warmth of the music, almost all these concerts will take place in old churches. The tour features Toronto’s alt-country darling Oh Susanna, Kevin Kane of The Grapes Of Wrath, and the tour’s organizer, British-born Luke Jackson along with a distinguished backing band featuring guitarist Kurt Swinghammer, drummer Don Kerr (Rheostatics, Ron Sexsmith), and double-bassist Jason Mercer (Bourbon Tabernacle Choir, Ani DiFranco). The string section includes Sahra Featherstone, Alex Cheung, Johan Lotter and Wendy Solomon. Special guests will be added in every town, making each concert a truly unique experience. 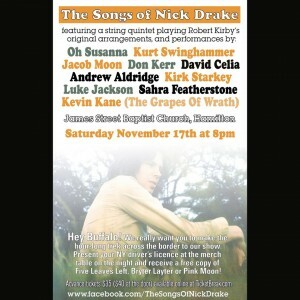 The Songs of Nick Drake was first produced by Luke Jackson at Toronto’s Trinity St. Paul’s United Church in November 2010. It was a tribute both to Nick Drake and Robert Kirby, with whom Jackson had collaborated on his last album. Kirby had planned to fly to Toronto to conduct the string section at a similar concert a year earlier, but passed away unexpectedly a week before the show was to be announced. The 2010 concert was a huge success, receiving unanimous praise, and was recorded and broadcast by the CBC. To coincide with the tour, Kurt Swinghammer is releasing Two Portraits: a limited edition 12″ single of his version of Nick Drake’s “River Man” through Toronto indie label Heading North Music. It is backed with a version of Donovan’s “Sunny Goodge Street.” The sleeve features Swinghammer’s portraits of both singer/songwriters.